Between Los Angeles and San Luis Obispo, California's Pacific Coast Highway (Hwy 1) merges with US 101 or splits off onto an uninteresting side road. Learn about the drive from San Luis Obispo through Big Sur to San Francisco, the most popular part of California Highway 1. Driving time: All day or longer. Average speed: 30 to 40 miles per hour. US Hwy 101 and California Highway 1 diverge in San Luis Obispo. Going north, you'll pass the entrance to California Polytechnic State University (Cal Poly) and soon drive out of town. About 10 miles from where you left US Hwy 101, the road meets the coast near Morro Bay. North of Morro Bay, the highway runs close to water. The dark-colored patches in the water are the canopy of an underwater kelp forest. Individual kelp fronds grow more than 100 feet (31 meters) long and as fast as 2 feet (0.75 meters) in a single day. Sea otters find food in the kelp and wrap themselves in the fronds when they sleep. Morro Rock: You can't miss the big rock that gives the town of Morro Bay its name. It's the last of the Seven Sisters, a chain of worn-down, ancient volcanoes that lie between Morro Bay and San Luis Obispo. Morro Bay: A side trip into this laid-back town with a nice, protected harbor, especially popular with families could last a few hours or overnight. Cayucos: One of California's cutest little beach towns, a bit old-fashioned, with a nice pier and beach and a fabulous restaurant (Hoppe's Bistro). Even if you don't stop, it's worth a driving detour. Exit at Ocean Avenue, the town's main street which intersects the highway on both its north and south ends. Harmony: This tiny place got a lot of press coverage a few years ago, so you may have heard about it. You'll find a winery there and a small pottery shop, but not much else. Cambria: Pronounced cam BREE uh, its the most sophisticated of the area towns, with lots of art galleries, bed and breakfast inns and lodging strung along a pretty coastal road, good for an overnight stop or a day's visit. 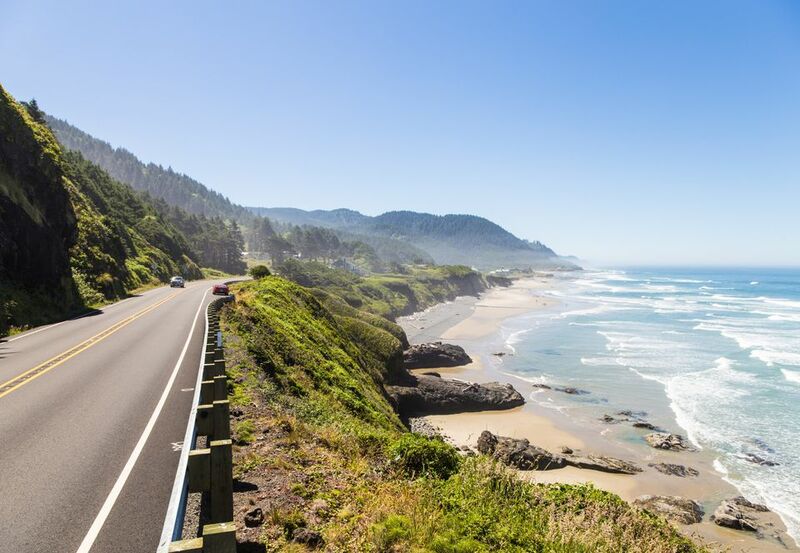 You'll find another short but scenic side drive north of town, along Moonstone Beach Drive. If you're lucky, you may see one of the oddest sights to be experienced in this part of California—a herd of zebras grazing alongside the highway. They are the descendants of animals brought to California for William Randolph Hearst's personal zoo near call box number 1-538 just south of San Simeon, but it's easy to know they're around because of the cars parked beside the road and people out photographing them. San Simeon: Its name is most closely associated with Hearst Castle, but it offers little except some places to sleep. William Randolph Hearst's monumental home at San Simeon is one of California's most popular tourist destinations. The 165-room, Moorish-style "castle" sits amidst 127 acres of gardens, terraces, pools, and walkways, furnished with Spanish and Italian antiques and art, flanked by three large guesthouses. It's on the hilltop above the highway, too far away to see much unless you take a tour. During busy times, tours sell out fast. If you arrive mid-morning without reservations, you may be disappointed to find that all the tours are sold out until late afternoon or even the next day. You can avoid this by reserving your tour online. Hearst Castle tour reservations are available up to 120 days in advance. Hearst Castle is a good place to visit the restroom and get something to eat, even if you don't take the tour. Depending on when you arrive, the 45-minute-long film Building the Dream gives an overview of the historic home and takes less time than a full tour. It's 65 miles between Big Sur and Hearst Castle, but likely to take longer than you expect. You'll stop for photographs, slow down to negotiate curves, and slow again to enjoy the views. Between Hearst Castle and Piedras Blancas, bucolic grazing land can make you want to spend your next life as a bovine. Further north, the road wrinkles like a slept-in shirt. The pavement plunges into the forest south of the town of Big Sur. Ragged Point: The hotel and restaurant may tempt you to spend the night and enjoy the cliffside scenery, but it's also good for a short break. Elephant Seal Vista: December through February, Northern Elephant Seals use the coastline for pupping and mating. One of only two places where you can see the spectacle on the mainland, it's 4 miles north of Hearst Castle. Piedras Blancas Lighthouse: The original lens is in Cambria, but a modern light keeps the old beacon going. Willow Creek: One of the best vista points, with cliffside and water level stops - and restrooms. Little-known and seldom-traveled, Nacimiento-Ferguson Road heads east over the mountains toward a historic Spanish mission and William Randolph Hearst's Hacienda. This side trip takes over an hour to navigate 17 scenic miles. Pfeiffer Beach: Exit Hwy 1 at the road to this pretty beach where purple-colored sand washes down from the hillside and a dramatic hole in the rock is just offshore. McWay Falls: a dramatic waterfall dropping onto the beach: Enter Julia Pfeiffer Burns State Park, park at the McWay Falls lot and take a short walk to the overlook. Condor Watch: California condors soar between Julia Pfeiffer Burns State Park and the town of Big Sur. With 9-foot wingspans and steady flight, they're so black they look like they're drawn with a felt-tip marker. Henry Miller Library: The writer's fans enjoy visiting his Big Sur home. Nepenthe: Restaurant and gift shop with spectacular views. You'll find gasoline and food at Ragged Point and in Gorda near Monterey County mile marker 10. The Lucia store also offers a few food items (mile 23). You'll also find restrooms at the Washburn Day Use Area between San Simeon State Park and Cambria. If your schedule allows a stop, you can explore more of Big Sur. You'll find some luxurious lodgings here, or you can camp in the woods or spend the night in a yurt. The information below refers to highway mile markers, which will help you know exactly where to find things. Point Sur Lighthouse: The lonely lighthouse you see on the big rock warned mariners of danger for almost 90 years. Tours are given on weekends. The entrance is located at mile marker 54. Bir Sur River Vista Point: It's one of the imponderables of traveling in California, but if the sign says it's a "vista point," you can be 99% sure it doesn't have much of a view. Instead of stopping at the marked spots, try a couple of our favorites. Between miles 55 and 56, it's particularly scenic: the beach widens as a stream cuts it way through the sand toward the ocean, curving around a big rock that seems determined to stop its progress. Vista Point: For one of the best views between Monterey and Big Sur, stop in the paved parking area on the ocean side of the highway between miles 58 and 59, where you'll find a spectacular scene of jagged coastline and crashing waves. If you're driving north, resist the urge to pull off in the unpaved area you'll reach first - the best views are blocked from there. Bixby Bridge: You can't avoid the Bixby Bridge, the arched span you've no doubt seen in countless automobile advertisements. The best place to stop and get a look or snap a picture is in the parking area just north of it. It's between mile markers 59 and 60. Gasoline and food are not available between Big Sur and Carmel, but it's only a short drive. The Monterey Peninsula is home to the towns of Carmel-by-the-Sea, Pacific Grove, and Monterey, each of them unique and fun to visit. The Monterey Bay Aquarium is here, as are Cannery Row, Pebble Beach, and the 17-Mile Drive. If you're in a hurry, you can get a quick look by exiting Highway 1 at Highway 68 (Forest Ave). Turn left onto Sunset Drive, which will become Ocean View Blvd. Follow the water's edge and you'll end up at the Monterey Bay Aquarium, where Del Monte Avenue will take you back to Highway 1. You can take a quick drive into Carmel on Ocean Avenue. Between Monterey and Santa Cruz, the climate is just right for growing artichokes, strawberries, lettuce and more crops of all kinds. The artichokes are the big, silvery-spiky-leafed plants, bearing their produce atop tall stems. If you see lots of plastic covering the ground, it's strawberries (plastic helps keep them clean and away from pests). Near the town of Marina, hang gliders float over the ocean. Further north, Elkhorn Slough is home to a lively cross-section of coastal birds and mammals. Near Santa Cruz, the highway gets very busy on any sunny weekend day and at rush hour on weekdays. Try to time your drive so you don't have to sit in a traffic jam, or take the side drive through town described on the next page. 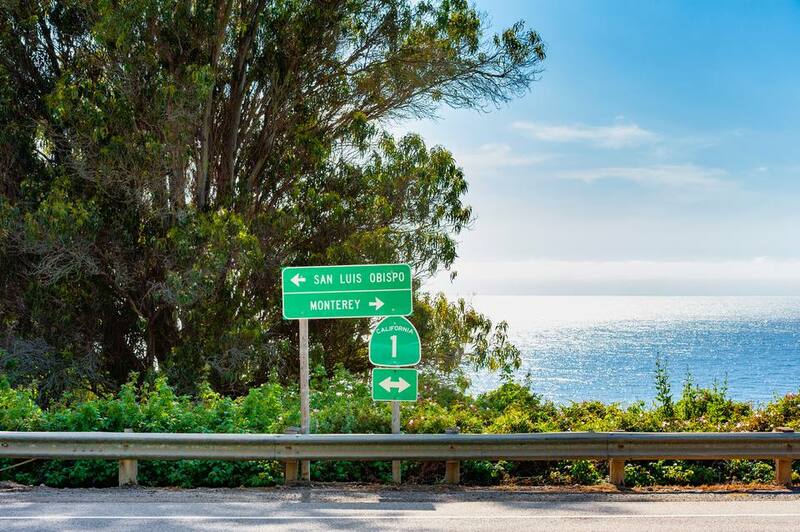 Staying on Hwy 1 while traveling southbound from Santa Cruz can be tricky, but is easier if you focus on the fact that you're headed toward Watsonville and Monterey. Traveling in either direction, observe the daytime headlights-on section of the road, which is quite busy and requires extra-attentive driving skills. This drive goes inland for most of its length, flirting briefly with the ocean at Moss Landing before returning oceanside near Monterey or Santa Cruz. Pezzini Farms: Exit the highway at Nashua Rd., just north of Monterey to visit their farm stand, where you can buy fresh artichokes, artichoke products, and sometimes even pick up an artichoke plant. Moss Landing: It's quite small, but it's the home of the Monterey Bay Aquarium Research Center (MBARI) and a small fishing fleet. Elkhorn Slough Safari offers a great way to get close to sea otters and wild creatures and Phil's Fish Market is a local favorite dining shop. After you get into town, just follow Sandholdt street across the small bridge to get to it. Watsonville Farmers Market: The produce is so good here that it makes you suspect the growers are keeping all the best stuff for themselves. Gasoline and food are available in Castroville and Watsonville, but you'll have to get off Hwy 1 to find them. You can find public restrooms in the parking lot just behind the Little Baja pottery shop, which is just north of Moss Landing. Santa Cruz is one of California's iconic beach towns, home to the Santa Cruz Beach Boardwalk, a classic oceanside amusement park. It's also one of two California cities who squabble over the title of "Surf City," with legendary Steamer Lane just off the coast and plenty of nice, sandy beaches to wiggle your toes in. Besides all the oceanside ambiance, you'll find a thriving arts community and a walkable downtown. Traveling south: Exit CA Hwy 1 at Bay Street, turn left onto Beach St, past the pier and Santa Cruz Beach Boardwalk. Turn left on 3rd Street and left again onto W. Cliff Drive. Follow that along the cliff tops past Lighthouse Field State Beach and the Santa Cruz Surfing Museum. Turn right onto Swift St. to rejoin Hwy 1. Traveling north: Turn right onto Swift St, shortly after you notice that you're entering the town. Make a left on W. Cliff Dr., veering right onto Beach St near the pier and passing the Santa Cruz Beach Boardwalk. A few blocks after crossing the river, turn left onto Seabright Avenue, then right on Soquel Ave and follow that until you rejoin Hwy 1. The section of Hwy 1 between Santa Cruz and San Francisco is more pastoral than parts south and north, the hills lower and rounded, with the land flattening just enough to make room for farms whose fields end at the coastal cliffs. Brussels sprouts are a popular crop here, and you may see and/or smell them if you pass during harvest season. Just one word of caution: They call it Devil's Slide and it certainly bedevils local residents by periodically disrupting traffic on Hwy 1 between Pacifica and Half Moon Bay. If the road is closed, I-280 and CA Hwy 92 form the detour between San Francisco and Half Moon Bay. Coastways U-Pick: Located just north of the Santa Cruz/San Mateo County line. Harvest your own strawberries (spring), olallieberries (summer) and kiwi fruit (winter). Ano Nuevo State Beach: Northern elephant seals use the Ano Nuevo beach for birthing and breeding and it's spectacle well worth seeing if you're nearby in January or February. Pigeon Point Lighthouse: One of the most scenic (and most-photographed) lighthouses in California. Pescadero: The drive into town is well worth the hour or so. Look for the signs near Pescadero Beach. It's between Santa Cruz and Half Moon Bay. Drive about 2 miles off Hwy 1 and turn left at the four-way stop. Stop at the Country Bakery for artichoke-garlic bread, browse local craftsmen's handiworks, visit the old rock guy or stop into Duarte's Tavern for a bowl of artichoke soup before continuing your trip north. Half Moon Bay: boasts a small downtown that's good for a stroll, too. It's well-marked no matter which direction you're driving. Gasoline and food are available in Half Moon Bay and in the town of Pacifica near San Francisco. Depending on the time of year, you may find farm stands open selling seasonal produce. Options abound for getting in and out of San Francisco, and the one you use depends on exactly where you're going. You may need a good map to figure it out. Highway One runs between the town of Pacifica (on the coast south of San Francisco) to the Golden Gate Bridge, where it merges with US 101 north for several miles before splitting off to continue along the ocean. In San Francisco, Highway One is 19th Street. It's a busy and mostly uninteresting route, with lots of stop lights and heavy traffic. Turn right onto Sharp Park Road shortly before you reach Pacifica, going up the hill to connect with CA Hwy 35 north. Turn left (north) when you reach Hwy 35 (Skyline Drive). Turn left onto Great Highway, traveling north past Ocean Beach and the Cliff House. The road curves there and becomes Geary Blvd., which will take you straight into Union Square and the middle of San Francisco. A faster but less scenic way to get to the same area is to stay on Hwy 1 north through Pacifica until it merges with I-280 north, then stay on I-280 to get to the city. Use the directions above. Follow Geary, turn left on 25th Avenue and right when you reach Lincoln Blvd. Shortly after you see the Golden Gate Bridge on the left, you'll go under ​a small bridge. Turn left immediately after that and you can get onto the bridge from there. Leave San Francisco going west on Geary Blvd to the Cliff House. The road curves south along Ocean Beach, where the street name becomes Great Highway. When you reach CA Hwy 35 (Skyline Drive), turn right (south) and stay on Skyline, ignoring the highway signs for Hwy 1. Continue south to Sharp Park Road (near the San Francisco city limits, where the signs point toward Pacifica), turn right and go down the hill, following the signs for Half Moon Bay. You will connect with Hwy 1 just south of the town of Pacifica.